Dry Rain Screen Panels - Architectural Building Panels, ACM, Metal SAF – Southern Aluminum Finishing Co, Inc.
Dry Panel, Ventilated, Pressure Equalized Rain Screen, or Rain Screen Panel Systems, including Rain Screen Curtain Wall Systems use gaskets, caulk, extrusions, painted metal strips, and combinations of these, are typically specified when a reveal is desired. These rain screens are a facade, requiring the installer to apply a weather barrier between the panel system and structural wall. SAF offers two kinds of rainscreens: drained-back-ventiliated and pressure equalized. Both meet AAMA 509-09 rating standard. Choose SAF C4000 ACM RainScreen panels with dimensions up to 5’ x 16’ in 3, 4, 6 mm standard polyethylene (PE), or fire-rated core material by Reynobond®, Alpolic®, Alucobond®, or Alucoil®. Or, choose SAF M4000 RainScreen 0.125 Aluminum Panels tested for air and water resistance per ASTM 283 and 331. Because M4000 RainScreen Aluminum Metal Panels are batch, rather than coil coated, custom colors are more economical than ACM for small and midsize exterior panel or curtain wall panel installation projects. SAF offers custom color service with a slightly longer lead-time. Designer finishes feature Kynar 500® or Hylar 5000® polyvinylidene fluoride (PVDF) resins. SAF can provide a manufacturer’s 20 year finish warranty on request. is designed to allow moisture to permeate the exterior wall, but subsequently drain through weep holes along the bottom edge of each panel. While any remaining moisture is designed to evaporate, the outside wall is not designed to act as a water/vapor barrier. SAF RainScreen Panels are a drained and back ventilated, incorporating a strip of composite material in the reveal between each panel (instead of caulk) resulting in a more uniform appearance. The C4000 ACM RainScreen and M4000 Aluminum Metal RainScreen systems come with fabricated metal panels and shipped-loose “track” extrusions. The fabricated panels include a “frame” extrusion, factory attached to the routed and returned edges of the panel that fits conveniently into the field installed horizontal and vertical “track” extrusions. Architects & design/build contractors can specify/install the SAF Series 4000 RainScreen Panel System for Florida commercial building cladding. The drained & back-ventilated ACM Panel system is certified to meet the Florida Building Code and requirements for High Velocity Hurricane Zone (HVHZ) standards. The 4000 ACM Panel RainScreen passed the TAS301 Test Protocol established for Miami-Dade HVHZ which includes TAS 201 (Large Missile); TAS 202 (Air, Water & Structure); TAS 203 (Pressure Cycling). Certifications issued for the SAF C4000 RainScreen system include panels from the three major Aluminum Composite Panel (ACM) manufacturers. is similar to the C4000 ACM RainSceen. It uses the same “track” and “frame” extrusions, but is manufactured with mitered frame extrusions and additional reinforcement in the corners of the panels. 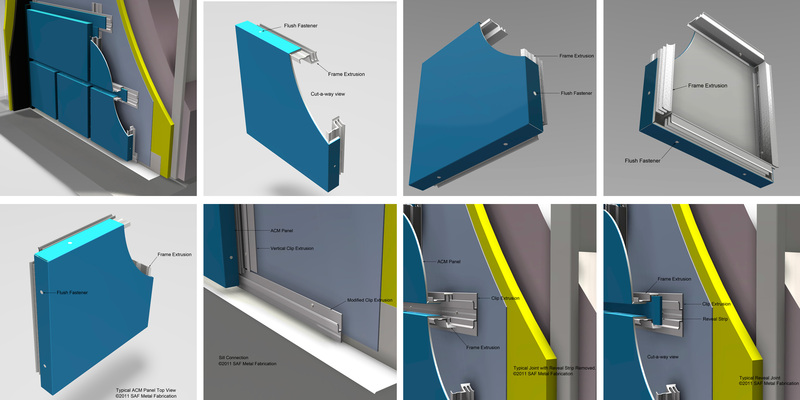 If the panels are manufactured by SAF and are properly installed the resulting rain screen will comply with AAMA 508. Like the 4000, the 4500 comes with fabricated panels and shipped-loose “track” extrusions. Download the complete SAF Building Panel Systems brochure: Architect, Specifier & Contractor Guide to SAF Panel Systems. Need to replace a single SAF C4000 / M4000 RainScreen panel without removing undamaged panels? Download instructions for the SAF Simple Fix Panel Replacement Kit: Simple Fix Single Panel Installation Instructions.